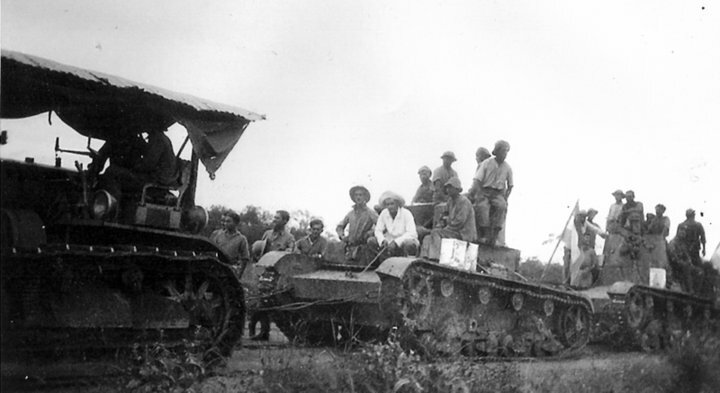 Even though the Vickers 6-Ton (Mark E) was never adopted by the British armed forces, it was a very successful export, equipping the armies of China, Siam, Poland (where it influenced the design of the 7TP) and the USSR (influencing the T-26) among many others. There were two main versions of the Mk.E: the Type A, which had two smaller turrets, each with a Vickers Mk.IVb class C/T 7.65mm machine-gun; and the Type B, with a single two-man-turret fitting a QFSA Mk.II L/23 47mm gun. Its modern design, for that time, made it the preferred alternative to the WWI-era Renault FT, its main competitor in the export market, which, by this point, was showing its age. The Mk.E was faster, more durable and more versatile than the French tank. This article will deal with another customer of this tank, Bolivia, which became the third nation on the continent of South America to acquire armored fighting vehicles after Brazil (12 Renault FT’s bought in 1921) and Argentina (6 Vickers Crossley Armoured Cars). 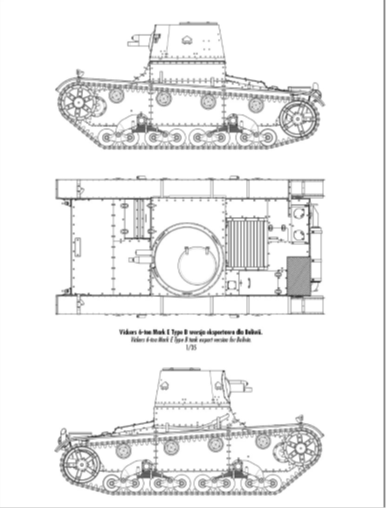 Blueprints of the Bolivian Mk.E Type B. Photo: Janusz Ledwoch (2009), p.16. Bolivia’s reasons for wanting to purchase war materiel were the growing tensions with its neighbor Paraguay over the disputed Chaco region, territory claimed by both countries. In 1928, there were border skirmishes, known as the Vanguardia Incident, but, with both sides recognizing neither was ready for a full-scale war, a peace settlement through the League of Nations was reached. Nevertheless, both nations remained bellicose and built up their forces in the region resulting in the outbreak of war in July 1932. Acting upon the advice of Hans Kundt a deal was sought with the British arms company Vickers to buy modern military equipment, aircraft and tanks. Kundt was a German who was Minister of Defense and Commander in Chief of the Bolivian forces having previously been a Lieutenant General in the German Army during WWI. Originally, the contract was going to be worth GB £3 million and included 12 tanks plus aircraft. However, the financial crisis caused by the 1929 Stock Exchange Crash meant that a new, more austere deal had to be struck. In the end, this agreement, concluded in October 1932, was worth somewhere between GB £1.25 million and GB £1.87 million and included 196 artillery pieces, 36,000 rifles, 6,000 carbines, 750 machine-guns, 2.5 million rounds of ammunition, 10,000-20,000 shells, 12 warplanes, and 5 tanks – 3 Mk. E’s and 2 Vickers Carden Loyd Mk.VI’s. However, not all that was agreed to was sent and what was sent was of dubious quality. To make matters worse, Argentina and Chile, who supported Paraguay, blocked the shipments for some time and once they reached Bolivia, poor internal transport routes to the Chaco meant that the tanks did not arrive at the frontline until the 20th of December 1932. The E tanks were of both A and B versions. The A version vehicle had the serial number ‘VAE 532’ and the two B versions were ‘VAE 446’ and ‘VAE 447’. They were also slightly different to the normal Mk.E tanks. ‘VAE 532’ was up-armored to 17mm from the original 13mm and all three vehicles included a can for drinking water, two fire-extinguishers, wire cutters, a chainsaw, and two spades as non-standard additional equipment. On arrival, they only had dark green camouflage, but sand colored bands were later added. All tanks were then grouped together in the ‘Destacamento de Blindados’ under the command of the German mercenary, Major Adrim R. von Kries. Photo of the Type A ‘VAE 532’ in December 1933. The camouflage tones can be appreciated. Photo: A de Quesada and P. Jowett (2011), p. 35. Their first action in the war took place in the 2nd Battle of Nanawa, in early July 1933. The accounts of this battle are patchy and there is some confusion regarding which tank was where at which point. Before the battle, they were divided up to support the two main advances in the north and the south. The North group, under the Austrian Captain Walter Kohn, consisted of, presumably, the one Type A and one Type B, most likely ‘VAE 447’, whilst group South was led by Major Wilhelm ‘Wim’ Brandt and consisted of the other Type B plus the two Carden Loyds. They were all under orders to act independently of each other supporting the infantry’s advance. 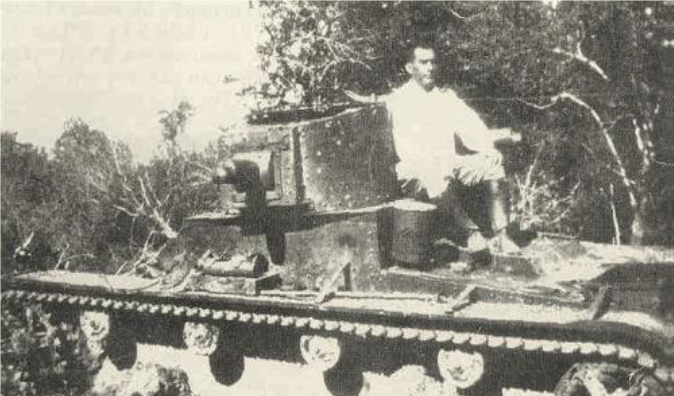 Initially, the Mk.E tanks were very effective, being immune to Paraguayan infantry fire, and they advanced destroying machine-gun nests and wooden emplacements along the way. To a point, they were too successful, when one tank, presumably ‘VAE 446’, under the command of the NCO Juan Saavedra Acha, broke the enemy line, but was forced to retreat for fear of being surrounded and was then captured due to lack of infantry support. The other flank was far less successful. The tanks advanced without any artillery support and got pinned down. Disaster struck when the Type B (‘VAE 447’) was knocked out on either the 4th or 5th of July. 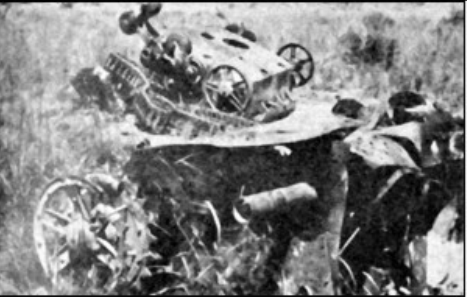 There are several theories as to what happened: 1. the tank was destroyed after grenades were thrown in through its open hatches (open due to the overwhelming and suffocating heat); 2. a 81mm mortar round penetrated the top of the tank; 3. the tank broke down and was then destroyed by Paraguayan artillery; or 4. it was hit by a 75mm artillery round leaving it immobilized and that it was later destroyed by Bolivian troops to prevent it from being captured. What is clear is that Captain Kohn, its commander, and the gunner were killed, while the driver was left wounded, and that the turret was in good enough condition to be then taken by the Paraguayans, who were victorious in what would be one of the largest battles of the war. The remains of ‘VAE 447’. Photo: Janusz Ledwoch (2009), p. 33. The Type A on this flank was also damaged when enemy fire jammed one of the machine-guns. From this very first engagement, a few conclusions were drawn that would remain persistent throughout the rest of the war. The Vickers Mk.E engine and suspension proved to be good enough to fight in these harsh conditions and had enough armor to defend itself against Paraguayan small arms fire, whilst the armament, especially on the Type B, ripped through the Paraguayan fortifications. However, lack of availability meant they were not used in large enough numbers, and their tactical use as independent entities in support of infantry proved to be inefficient. Moreover, the heat, rising to as high as 50ºC made fighting difficult and affected the tanks in two ways: 1. it meant they had to fight with open hatches creating vulnerable spots; and 2. the heat affected the gun’s closing mechanism, which slowed down loading making it an arduous task. The following month, the two remaining Mk.E’s were repaired and transported for deployment in the Battle of Gondra. This clash took place between March and December 1933, but the tanks, along with the only remaining Vickers Carden Loyd Mk.VI, only fought between the 23rd and 26th of August. Here, they were deployed in conjunction against fortified Paraguayan infantry positions, where the 47mm of the Type B proved to be particularly effective in destroying wooden fortifications. Following the battle, they were assigned to the reserve of the 1st Army Corp and moved to the fort of Saavedra. In the subsequent months, they were employed individually as infantry support. 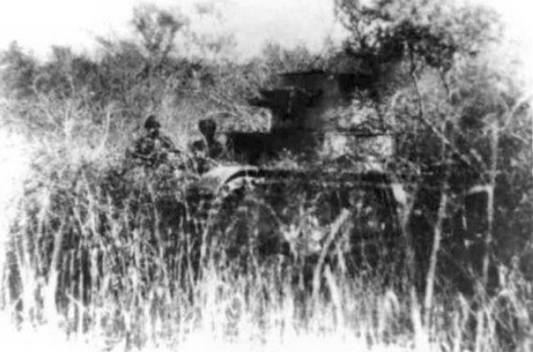 Even though their engagements were few, the Paraguayans were sufficiently concerned to create dedicated tank hunting groups and to set tank traps across the Chaco region. Lack of adequate anti-tank weaponry led these hunt squads to adopt unconventional methods. 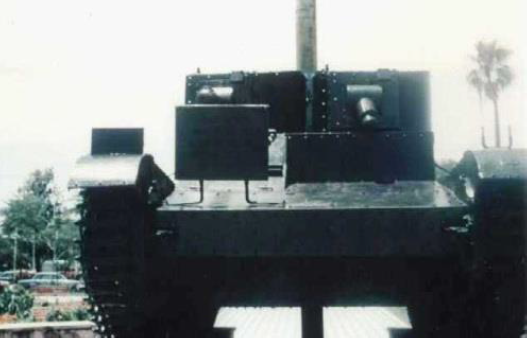 The tank hunting unit attached to the 7th Cavalry Regiment ‘San Martín’ would become renowned. 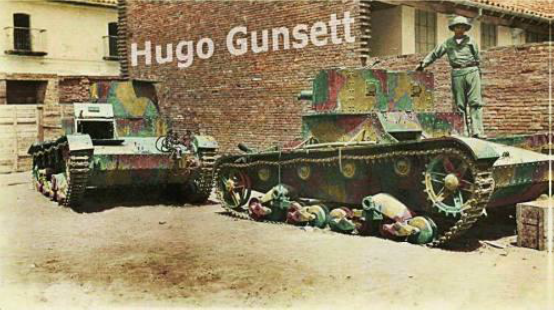 The two remaining tanks were deployed together again in the Second Battle of Alihuatá in December 1933. 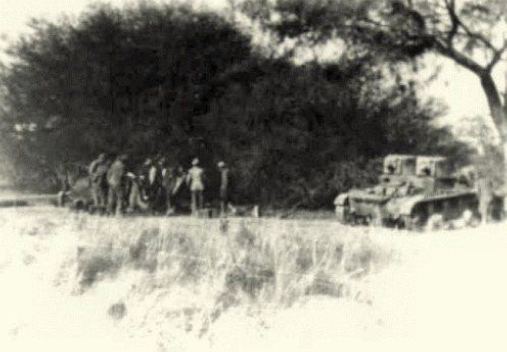 In the last days of the battle (December 10th-11th), the two tanks were captured by the Paraguayan 7th Cavalry Regiment ‘San Martín’ at the 21st-22nd kilometer of the Zenteno-Saavedra road. Alerted by the rumble of the motors, the cavalrymen resolved to cut down trees to lay across the road in front and behind the tanks. With the road blocked and no way to escape, the tanks, commanded by the Germans Ernst Bertel and Fritz Stottuht, decided to defend themselves from the Paraguayan forces with machine-gun fire. After two hours of combat, with one of the commanders wounded, and with temperature inside reaching 50ºC, combined with fatigue and the lack of infantry support, the tanks had no option other than surrender. 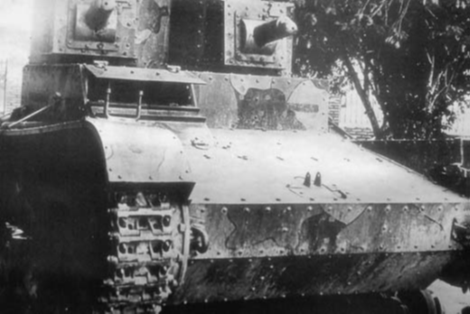 After being captured intact at Alihuatá, the tanks were taken back to the Paraguayan capital of Asunción to be exhibited as war trophies. Even though they were never put into service, they were the first and only tanks Paraguay had until the arrival of American M3 and M3A1 Stuart tanks more than a decade later. 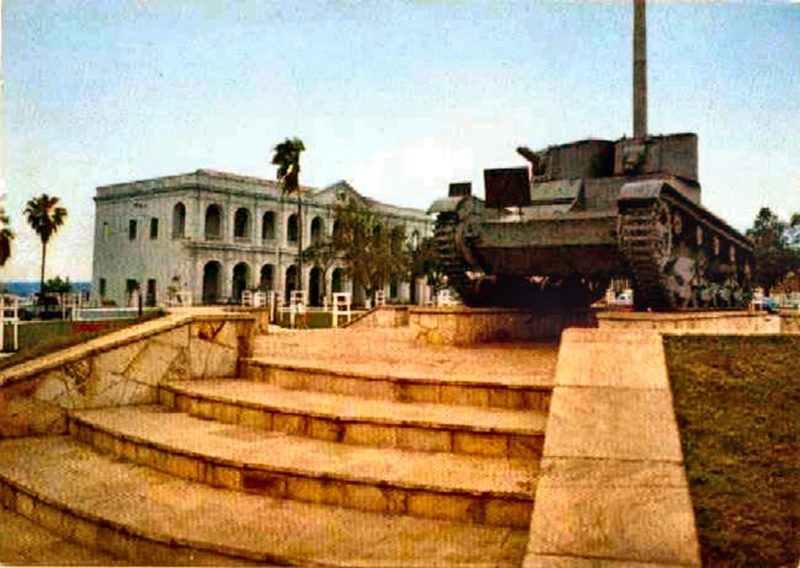 Sometime during or after the war, the Type A (‘VAE 532’) was moved atop a pedestal in the grounds of the Military School in Asunción where it would remain until the 1990’s. 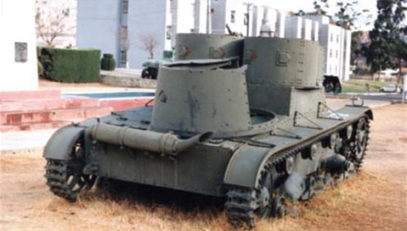 The Paraguayans named this tank ‘Ina’. The turret of the ‘VAE 447’, which was captured after the 2nd Battle of Nanawa, was exhibited in the Paraguayan Armed Forces Museum. 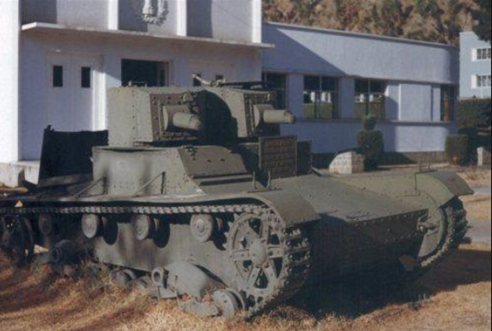 For several years, in many books dedicated to the Spanish Civil War, there were claims that one of the captured Vickers, the ‘VAE 446’, was sent to Republican Spain as part of a weapons sale of excess and captured material in January 1937. There was a law in place (Decreto-Ley 8.406 signed on January 15th 1937) which authorized the sale of excess and non-necessary war materiel. Article 1 Point C refers to ‘VAE 446’ and puts the sale price at US $1040. Records prove that Spain did indeed buy rifles and machine-guns from Paraguay. However, there is no photographic evidence to prove the tank was part of a larger purchase and it cannot be confirmed. The story is that the Swiss arms trafficker Thorvald Elrich secured the tank for the Republic which arrived in Spain in September 1937. It is possible, that for the sake of cohesiveness, the turret was removed and replaced by that of a T-26 (a tank based on the Mk.E to start with). To add to the confusion, some scholarship of the Spanish Civil War at times refers to the Soviet T-26 tanks as Vickers tanks. No trace of the tank can be found and if it was never sent to Spain, it is possible that it was scrapped. 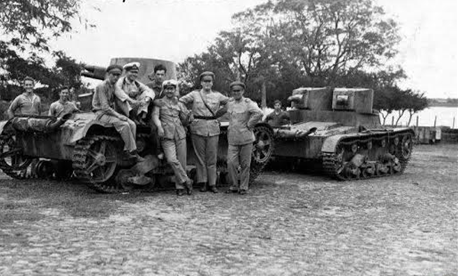 There are also claims that Portugal sent their two Vickers Mk.E’s, one Type A and one Type B, to fight on the Nationalist side, though these seems highly unlikely. The truth may never be known. In 1994, as a goodwill gesture, ‘Ina’ and the turret of ‘VAE 447’ were given back to Bolivia. Today they can both be found on display at the Colegio Militar del Ejercito in La Paz, with the turret being put on top of the rear of the Type A. A plaque on the tank’s front gives a brief history of it, with special emphasis on the 1994 gesture. I am a bolivian researcher of the isssues related to the use of the Vickers tanks during Chaco War. Most of the content in your article seems extracted from many posts I’ve made during the last 11 years in several internet forums as well as some unauthorized compilations of them made by third parties, and also contains several mistakes related to the purchase process, delivery and use in combat. I wrote a book about this topic, that hasn´t been published yet, but I’ve shared some key points of it on the forums where I participate, and surprises me finding every now and then parts of those text shared without crediting the author. The illustration from David Bocquelet about the cammouflage pattern is incorrect. According to the manufacture records, the base color used for Bolivian Vickers was deep bronze green, with sand and brown spots. all colors separated with black lines 1 inch thick. Primero de todo, gracias por estos apuntes sobre el Vickers. En TE siempre estamos interesados en mejorar nuestros artículos de la mejor forma posible. Por desgracia, al vivir en Europa, no he podido tener acceso a la información en los archivos bolivianos. Obviamente queremos dar crédito al autor correcto, pero por desgracia, a veces con fuentes online eso es difícil. La ilustración está basada en un dibujo en la prestigiosa serie de libros Osprey, pero, dada la poca información sobre el conflicto en Europa, no me extrañaría que fuera equivoca y que fuera como usted indica. Cambiar la ilustración requeriría tiempo, pero intentaré que se haga correctamente.